Pink Love is Blind Badges. 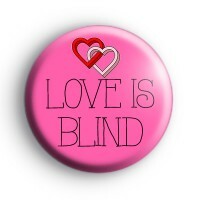 A bright pink love is blind badge with funky black text, perfect for the love of your life. This romantic badge can be used on Valentine's Day to wear or to decorate something for your valentine. We have a great selection of Valentines day badges so be sure to checkout our Valentines Day category down the left-hand side of the website.